With riot police out in force on the streets of Tehran, Mahmoud Ahmadinejad took the oath of office Wednesday and began a second term as Iran’s president. Ahmadinejad, 52, was formally sworn in before Iran’s parliament as security forces guarded the building and the streets nearby in anticipation of possible protests. He vowed to promote religion and morality, and support righteousness and spread justice. 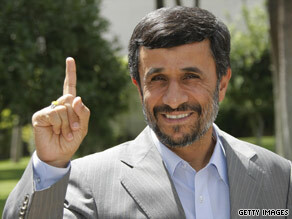 “I will guard the power that the people have entrusted in me as the sacred trust,” Ahmadinejad said. “I will safeguard it like an honest and faithful trustee.” Ahmadinejad, however, starts another four years in office with many Iranians questioning his legitimacy. The results of the June 12 election were widely disputed; Ahmadinejad’s chief rival, reformist Mir Hossein Moussavi called the elections a “fraud.” Since the vote, Iran has seen turmoil not witnessed since the 1979 Islamic revolution as thousands have taken to the streets to protest and security forces have brutally cracked down. Iran says about 30 people were killed in the violence.